Geraldine is one quarter of a family that lives and breathes cycling (in between structural engineering, snowboarding, and surfing)! I got to known Geraldine when I started club cycling in 2002, and saw her at road races. Little did I know that she had only recently started cycling herself, back then! Yet Geraldine was always very welcoming and offered biking tips and advice. She's also been very helpful in assisting people who want to develop their cycling - be it accompanying youngsters from the local cycling club to races around the UK and beyond, or hosting the Rwandan Cycling team in her home. "Mummy G" has been an impressive figure in the London cycling community, getting out and encouraging others, even after her terrible road traffic accident, which could have put many people off cycling for good. 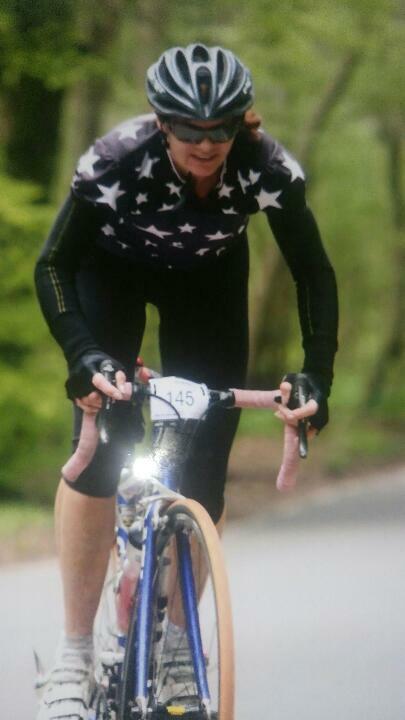 “I started cycling at the age of 36 after responding to a notice in a local paper to join a riding group for beginner women. I had never ridden a bike before. As a child, my brother being the only boy was given a bike, but I didn't get the same opportunity. Since my husband, Marek and two children Philip and Anna were besotted by cycling I felt I needed to see what the sport was all about. It was a case of ‘can't beat them so join them’, particularly as Philip and Anna were urging me to start cycling. Maybe if I didn't ride I would have become a bike widow. My first outing was a seven-mile ride, stopping for tea and a Kit-Kat. My balance was terrible and I was very nervous of the traffic, but John Turnbull the ride organiser was so patient and amusing. I went home on a high. It was life-changing for me. After some time, I started doing long rides with a group called the ‘Over The Hill Gang’, which goes out during the week in the lanes around Surrey and Kent. I met an inspiring woman, Ann Bath, who encouraged me to compete in a 10-mile hilly time trial. It was great. Then I did road racing, which was really tough. In my first race I couldn't breathe properly and suffered. I was so happy to have finished and to have been encouraged by other riders, that I repeated the experience and slowly improved and gained confidence. As well as that, I did a few track omniums and mountain bike races. I loved the skill, speed and reactions in racing, particularly on the track. Cycling really is my sport. It's my means to escape from life's normal problems. It keeps me fit and active as well as having a like-minded community to call on. For me, cycling provides a social life, and an appreciation for the simple enjoyment of being outdoors. As far as my family is concerned I know it has kept us close as we are interested in what each other is doing in the cycling world. We know many of the same people, talk the same talk - it’s great. I must also highlight that we do have a life outside cycling, as we run a structural engineering consultancy and sometimes get involved with personal building projects. Both Philip and Marek are structural engineers, and I work in the company too. I feel I am an extremely lucky woman, because in 2005 I was knocked off my bike by a speeding car on a fast dual carriageway, the A217 in Surrey. I went over the bonnet and smashed the windscreen and missed a wooden stake by inches. My right leg was shattered, but the surgeons were fantastic and saved my leg by putting a titanium pin in. After I recovered it took me six months to get back on a mountain bike as I didn't initially want to ride on the road. Thankfully I was protected, and helped by the cycling fraternity to get back into cycling again. Nowadays I tend to do long, challenging road and mountain bike cyclosportives, which give me so much satisfaction and allow me to go to different places and countries. One of my favourite places to ride is Mallorca. The roads, climbs, cafes, sun and company make for superb riding and fun. I usually go there in May and am a Ride Leader on the Legros Training Camp. My favourite bikes are my Argon 18 carbon road bike and my Trek Procaliber. When I ride the Argon it feels like I'm flying. The Procaliber is a fantastic bike to experience the challenges of mountain biking now that I'm in my fifties, and it makes me want to improve and up my game. When I go out cycling I am never without my phone. As well as having it for emergencies, I use it to take photos to remind myself of the wonderful views, people and experiences I have on my rides. Cycling has given me some unforgettable experiences. For instance, I did a nine-day cycling trip from Geneva to Nice (La Route des Grandes Alpes). 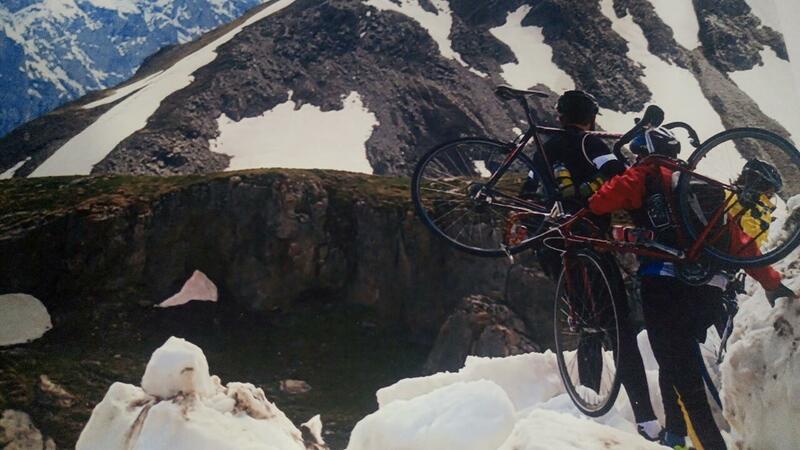 The weather was atrocious, which made each day a challenge both climbing and descending the Alps. Three of us experienced climbing over a fresh avalanche on the Col du Galibier and lived to tell the tale. 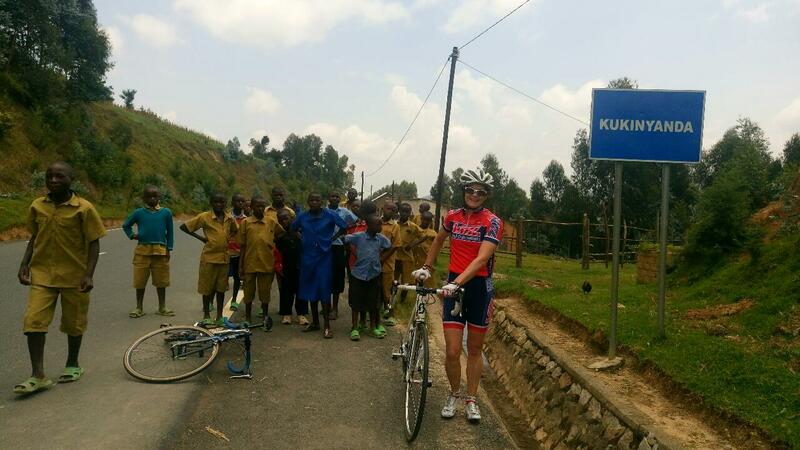 Our family has also been supporting African cycling projects. The Africa Rising Racing team was instigated after the Rwanda Genocide to show that the various factions could work, train and live together, giving hope of re-uniting all the Rwandans after the most horrendous war crimes. 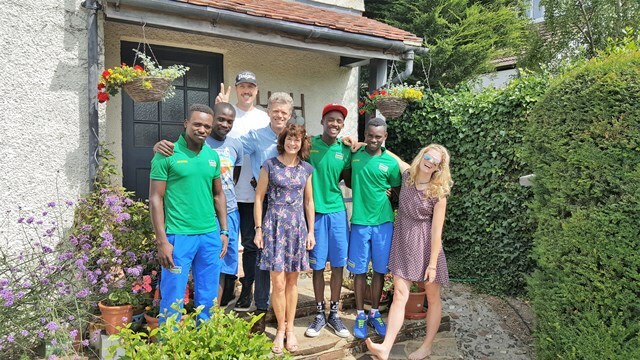 We went to an auction to help raise funds for the team, and ended up bidding and winning a trip to Rwanda to cycle with some of the team riders. Marek and I went on the trip in January this year. Also we were asked by Anna one evening, after we’d had a few gin and tonics, if we would host for two weeks four riders from the current team and their coach, so that they could race here. It was a great time and we were happy to be involved in helping these unspoilt lads gain their dreams of getting onto international sponsored teams. There are still cycling adventures I would like to have. It would be great to take a bike and a bivvy sleeping bag to cycle and sleep in the open air frequently. I would also like to hire an Italian castle for a month, invite cyclist friends to join us for rides, eating, and drinking - simple! I would like to inspire other people to ride and enjoy cycling no matter what age they are. For anyone wanting to get into cycling, particularly an adult who may not know how to ride a bike, my advice is to be patient with yourself. Learn to walk before you can run. Join a cycling club that does beginner rides, listen to the advice they give, and enjoy the fellowship and tea-stops.